Automated data migration from LiveChat is now possible with Help Desk Migration service! We added a new function to our Migration Wizard, so, from now on, LiveChat users are able to move their records to a new help desk automatically. The custom migration (in case of any additional requirements) will also be available with our service, of course. There’s a standard list of data types that you can automatically transfer with Migration Wizard. With LiveChat, it’s all the same, except it’s impossible to migrate custom fields, inline images, and organizations. Note: In LiveChat, it’s possible to add CC to any ticket. However, the end-users tied to the ticket CC will only migrate if they replied to this certain ticket. If there's no reply, these end-users won’t be transferred to the new platform. There is no distinctive difference of any of these records migration. The only peculiarity is the possibility to transition Chats. 1. Chat records will export only during the full migration. In other words, they won’t be displayed in the records after you complete the demo. 2. All Chats will have a Closed status in the new help desk. 3. At the target platform, all Chats have a Subject which the system will display as “Chat with ID” + the ID itself (the same as at LiveChat). 5. 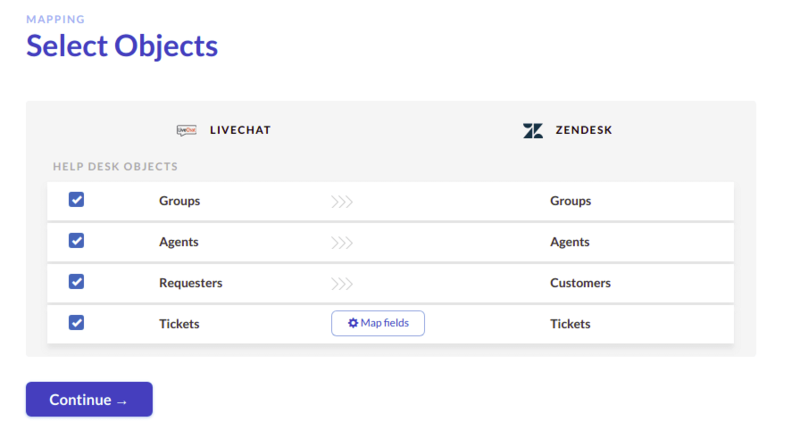 Chats will also preserve their connections with assignees (agents) and their groups in the new help desk platform. 8. If the user (customer) left neither name nor email, you will see “visitor@without-email.com” as the chat initiator. So, if you were looking for a chance to seamlessly move to a new platform, don’t lose your time, and get ready for your LiveChat export. Remember, Help Desk migration service is always here to assist you at any step of your record transition. Now, just set up a Free Demo Migration on our website! In case of any additional questions, feel free to consult our Knowledge Base or contact us directly. Ready to migrate from LiveChat? Use automated and secure service.